"University Hall (UNIV) is the only building remaining of the original six-building Purdue campus. 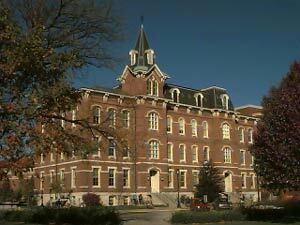 Construction of the 'The Main Building,' its original name, was begun in 1871 where Smith Hall presently stands. This work was halted when the University purchased land north of State Street, and the final construction was started in the Fall of 1874, about the time of the first students' arrival. The cost to complete the building was $35,000, and it was dedicated in November of 1877. It was used as a classroom and the University's first library. It also held the chapel and the president's office until Fowler Hall was built in 1904. University Hall was remodeled in 1961. "John Purdue requested that he be buried in front of University Hall, and his grave directly east of the building still serves as a monument to him and the university he loved." The Department of History resides in the hall today.